Mark Hughes on the sideline on Saturday. 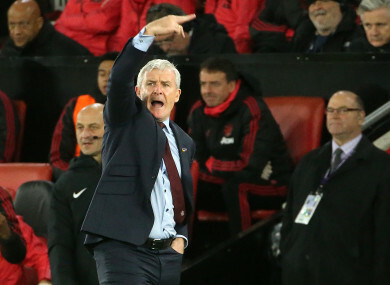 RELEGATION THREATENED SOUTHAMPTON have parted company with manager Mark Hughes, nine months on from his appointment. The Saints sit 18th in the Premier League, one point above rock-bottom Fulham. That point was earned on Saturday with a 2-2 draw against Manchester United, but having led 2-0 after 20 minutes, a sixth draw of the season was a disappointing outcome. Hughes is followed through the exit door by his assistants Mark Bowen and Eddie Niedzwiecki, with coach Kelvin Davis handed temporary charge for Wednesday’s Premier League meeting with Tottenham Hotspur in Wembley. “We would like to express our thanks to Mark and his staff for all of their efforts during their time at St Mary’s,” the club said in a short statement of the man the appointed in March. Email “Mark Hughes sacked by Southampton after home draw with Manchester United”. Feedback on “Mark Hughes sacked by Southampton after home draw with Manchester United”.